In order to qualify as a good candidate for dental implants, you must have a sufficient quality and amount of jawbone structure to support the titanium posts. Unfortunately, when you lose one or more teeth, your jawbone will begin to deteriorate. Tooth roots naturally stimulate the production of healthy bone cells, and when a tooth falls out, the tissue is distributed to be better used elsewhere in the body. This means that if you have been missing teeth for some time, you may not have enough bone to support the restorations. However, a bone graft procedure at our Woodinville practice can build up the volume and structure of your jaw so that it can accommodate dental implants. To learn more about bone grafting and find out if it is right for you, schedule an appointment at Signature Smiles today. Before your bone graft, you will have a consultation and examination with Dr. Dowd or Dr. Wu. 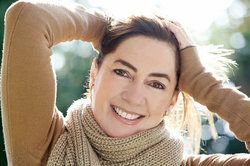 At this appointment, you will be able to explain your restorative and cosmetic goals and learn more about your treatment options. We want you to be an active participant in your treatment and feel completely at ease about the bone grafting and implant procedures. Using computed tomography (CT) scans and other advanced imaging techniques, your dentist will examine the structure of your jawbone and determine where the bone needs to be enhanced in order to support your implants. Our doctors use allografts, or bone from a donor. Allograft benefits include fewer surgical sites and as a result, a shorter recovery period. The dentist will perform the procedure under sedation, supplemented with local anesthesia. They will make a small incision in your gums and anchor the bone sample in the jaw using tiny screws. Bone marrow and grafting material may be placed around the edges of the new bone before the incision is closed. You will typically need to wait several months for the bone to heal before you receive your dental implants. Bone grafts have a very high success rate, especially for non-smoking patients in good physical health. No two bone grafting procedures are the same, and Drs. Dowd and Wu will determine the best course of treatment to meet your needs. If you need to replace molars with dental implants, we may recommend a sinus lift procedure. During this procedure, the dentist will move your sinus membrane and graft bone in between the jaw and sinuses. If your jaw is too narrow or soft to support dental implants, we also offer ridge augmentation. During ridge augmentation, your dentist will create a space in the middle of the jawbone and will graft bone into this space to widen your dental ridge. If you have been told you are not a candidate for implants because of a compromised jawbone, call our office to schedule a consultation today. A bone graft performed by our highly experienced and skilled dentists could be the answer you have been waiting for.